It is most definitely here…summer…we are all melting, eating far too much ice cream, and looking forward to that six week break full of summer travel and activities with a mixture of trepidation and mild alarm. So what better time for me to give some love to some most excellent blog posts on t’interweb that help us over the coming few weeks to both entertain the kids, and to know what to expect when we bundle them into a car or a plane to take them to foreign lands. Here are a few top tips post for the coming summer festivities. If you have any more, then add them to my linky. The more the merrier! Sometimes its all in the planning! So Little Lilypad has some tips for planning that family day out, so it runs more smoothly. If you know what you need when you are going with the young ‘un, it helps big time. So thanks Mrs C for the list of essentials for holidays with a toddler too. Cass from Frugal Family is making sure her summer works well by planning the best summer holiday ever…she is really making sure she thinks it through properly as she is opting for a free range summer with her kids – something Mum in the Madhouse is very keen to encourage this year. Why not join in with this too and limit your kids screen time, and get them having fun in the good old outdoors? This is a pain even when you don’t have kids, but when you do, there is a certain face that greets you when people notice that you have a small person with you. And its not necessarily a face you would give your own mum and dad. With that in mind, Mummy Alarm has given us a bit of help when flying with babies after her own experiences with her five month old. We also have a post for long haul flying with kids on this blog too, so that’s worth checking out as well. Jennifer’s Little World has also touched on travelling with younger children on long haul flights. Plenty there to help you out methinks. BUT, if that’s not enough, then Domestic Goddesque has some tips to keep kids occupied on long journeys, which is clearly very relevant on flights of course. Never fear, the bloggers are here to help you out with this as well. We have some good car travel with kids ideas on KiddyCharts, and so does iVillage as well with a few sensible suggestions for making those long car journeys more manageable. Wendy’s World has a couple of games to play in the car too, and Parentables has some excellent “Road Trip” printables, and yes there is a US bias, but a lot of these will work wherever you are driving! What if you aren’t actually going anywhere though? How about you just enjoy your staycation then with these top tips from Jennifer’s Little World too! Summer Holiday Boredom Busters from Thinly Spread which gathers the best of the crafts and other activities out there for the kids, so we don’t have do, though I still am just a little bit! TeePee Building from Here Come the Girls, and why wouldn’t you want to do this, exactly? 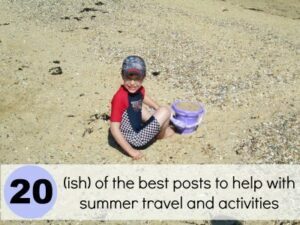 So there we have it – 20 (ish) of the best posts I found on helping you with that summer travel and activity holiday chaos with the kids…see it needn’t be so bad after all. If you have any other posts, then feel free to link them here so people can find them – be great if you can link back to this list as well, so we can all share the love too. Plenty of great tips here. Our best tip for cars is travel early or late so you don’t sit in traffic and drag the whole thing out. A great collection of ideas, and thank you for linking to the posts on my blog! Hi Helen, here’s a free fun one for the family – finding the Yorkshire Dales ‘lost sheep in yellow jerseys’ – combines sightseeing and walking with a competition to find the lost sheep! Helen, feel free to link your Linky to mine too, if you’d like to! Can I link to my Linky post for family days out? Or is that not the done thing?! No idea if its the done thing or not – but its fine with me! What a fabulous collection of tips!